Our long-standing friend and collaborator Cameron Buchanan was around for a day of jamming, eating cheese and talking art and music. 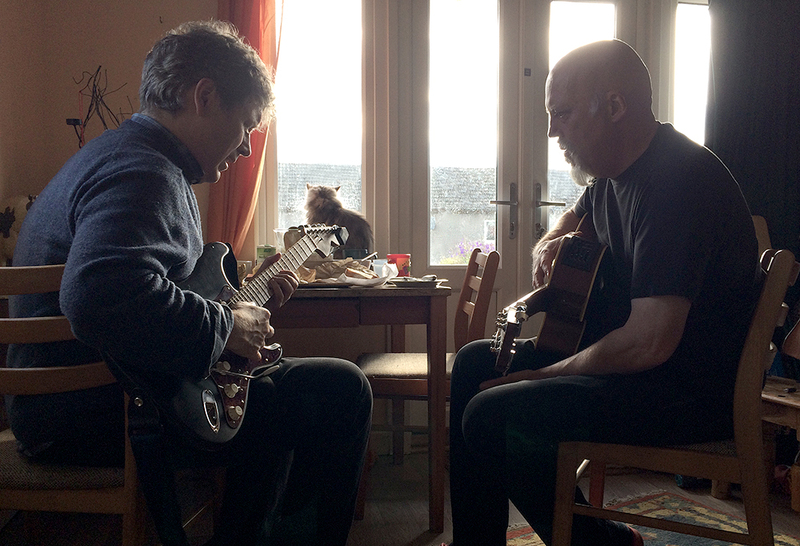 Cameron’s a lovely jazz guitarist – he’s a joy to have around as he makes such a beautiful noise, to be honest. However, inviting another creative into our studio has so many other benefits to our practice: a fresh perspective, new ideas and lots of questions about what we’re doing and why. 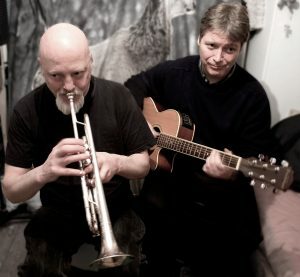 John and I see the improvisatory and spontaneous nature of jazz as a form, as an important aspect of our art/music practice. For me – with my art background – it’s fascinating to observe (and hear) two jazz musicians playing together and doing that jazz thing. And I do mean ‘playing’ in every sense of the word, they’re like a pair of kids pulling a stream of toys out for each other, as they play a tune together. The jazz musician’s drive to avoid planning and seek-out spontaneity never fails to amaze me. Cameron brought round his new guitar, he actually left his main instrument at home. This was the first time he’d played this new guitar, yet he didn’t hesitate to agree to doing a live performance with John on Facebook.